At James Bradley & Sons Funeral Directors, we understand that this can be a difficult time, which is why we are here when you need a shoulder to lean on. Our duty is to support you and organise a funeral that is a true reflection of your loved one’s life. You can find our funeral home on North Road in Clayton, Manchester. From here, we have served the communities of Newton Heath, Openshaw, Droylsden, Fairfeild, Bradford, Beswick and the whole of Greater Manchester, including the likes of Stockport and Tameside. 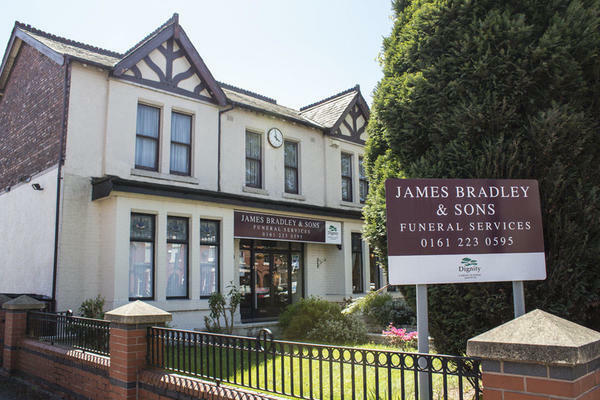 We also have another James Bradley & Sons Funeral Directors in Wythenshawe. Since the 1940s, we have been giving all the families that come to us in their time of need an outstanding standard of funeral care. We will look after you and your loved one as if you were one of our own family members. By tailoring your loved one’s funeral to your exact needs, we will ensure your loved one’s funeral creates lasting memory for those who attend. We have experience of conducting funerals of all types, from contemporary celebrations to traditional or religious ceremonies. Looking after you is our number one priority, which is why our approach is flexible and we will go above and beyond to make you feel comfortable. You have numerous options to see one of our funeral directors; you can pop into our funeral home, book an appointment or we can visit you at your home. Whatever is the best for you. Alternatively, we are on hand any time, day or night, to answer any questions you may have. Call us today on 0161 223 0595 to talk through your personal requirements. You can access our funeral home from either Portway or Simonsway. Our staff are available 24 hours a day on 0161 223 0595 if you require our services outside of these hours.